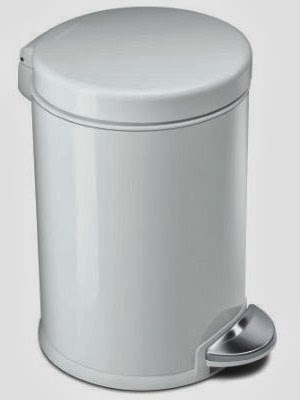 I used to have a cute silver trashcan in the master bathroom. I got it for a steal at Kohl’s and it looked great in the room (as great as a trashcan can look). But then we got Ringo and discovered that he likes to get into the trash (he especially likes to eat Kleenex). So every night before bed I put the trashcan up on the back of the toilet so he couldn’t get into it while we slept. That got old REALLY quick, so I decided to buy a trashcan with a lid. I ended up buying this one from Amazon. It kept Ringo out of the trash so I was happy, but it’s pretty boring looking. I lived with it plain for almost a year, but I finally decided I needed to jazz it up a bit. I didn’t want to do anything permanent, so I decided to add some silver vinyl polka dots. I used my Silhouette to cut out the dots, but you could also do this with a punch or with scissors. I used Cricut-brand vinyl (in silver, obviously) for this project. Yes, Cricut-brand vinyl on a Silhouette…scandalous, I know! I placed the polka dots randomly on the trashcan. I even cut a few of them to place around the bottom edge and where the lid meets the can. I ended up using about 60 polka dots to cover the trashcan. I think it turned out so cute! This isn’t a groundbreaking project, but a lesson that something can be practical and pretty…even if it’s just a trashcan! What a great idea! Soooo cute! 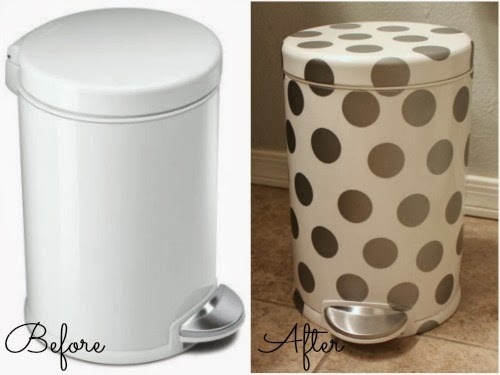 I might have to do something like this to my garbage can in our kitchen (since it doesn't fit under our sink). It's really pretty and I think it's very important as we use the trashcan several times a day, so it's going to make you smile several times a day! Who new a trash can could be so cute! This is adorable! I seriously love this so much! It changed the whole look of the trash can. Who knew a trash can could be so cute! Super cute. And I'm so curious - which one do you prefer? Silhouette or Cricut? It's hard to say because I've been using my Silhouette for a couple years, but I've only used my Cricut once. We'll see how I feel after a couple more projects!